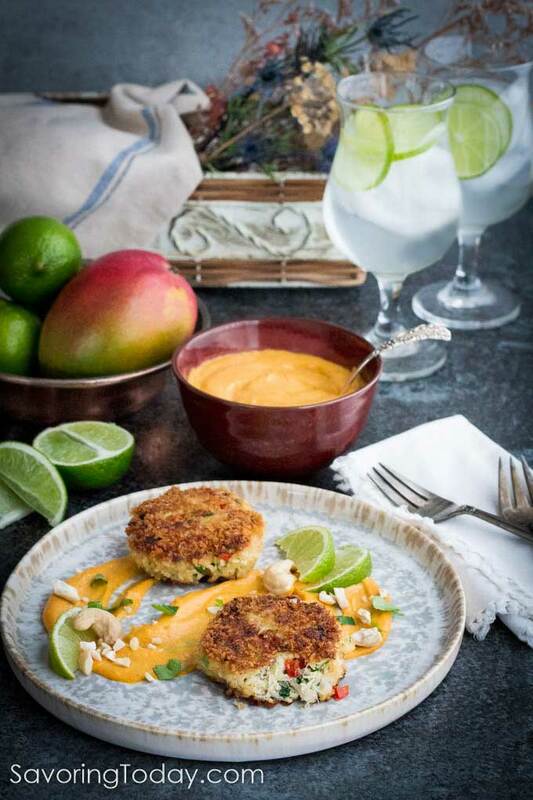 Crab Cakes with Mango-Lime Cashew Sauce is a simple, elegant recipe for an easy Valentine appetizer or entree. Make your dine-in date night irresistibly delicious! Valentine’s Day has become a favorite time for us to cook together. Planning a menu and creating a romantic dinner at our own table means no crowds, no pressure, and dress as you please. Crab makes any meal feel like a celebration and we adore how uncomplicated, yet extraordinary it is. Wrapped in a crisp exterior, this recipe highlights sweet crab with savory spices and marries beautifully with the mango, lime, and chipotle flavors of the sauce. These crab cakes need a couple of hours to chill and set once prepped, so be sure to figure that into the time you allow. The easiest thing to do is prep them the day before so there’s no pressure when it comes to making dinner. It’s important to consider flavors and textures to complement crab cakes so the subtle, sweet flavor of the crab meat stands out. Appetizers – Garnishes like our garlic aioli, sweet chili sesame sauce, or this mango-lime cashew sauce add a touch of spice to balance the sweetness of the crab and contrast the crunchy coating. Breakfast – I haven’t decided which I like better, crab cakes for dinner or the leftovers under a poached or sunny side egg for breakfast the next day. I guess the best answer is, make enough so you can have both! Salads – Tender greens are ideal as a side or main salad. Arugula is especially light and tender with a unique peppery flavor to enhance the crab cakes and dressing (shown in photo below). To make the cashew sauce into a salad dressing, thin with 1 tablespoon oil and 1 or 2 tablespoons water. Main Course – Enjoy Crab Cakes with Mango-Lime Cashew Sauce with a side of roasted asparagus (you’ll love the sauce on that too!) and fingerling potatoes for an easy date night dinner in. or crushed nuts for the coating. and substitute crushed pecans for the panko crumbs. , substitute crushed pecans for the panko crumbs, AND enjoy with Roasted Garlic Aioli or Gochujang Aioli in place of the mango sauce. 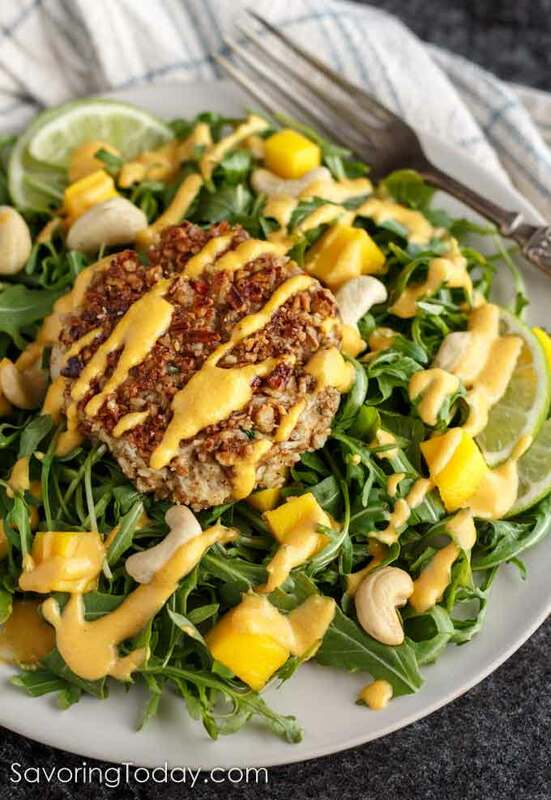 Crushed pecan coating for a Paleo diet-friendly crab cake salad. Dressing is made by thinning the sauce with a little oil and water. Select lump crab because you’ll want some larger, meatier pieces in there for the best texture. Blue crab is the tastiest option with a delicate, sweet seafood flavor. Prep-ahead, cover and store in the fridge for up to 48 hours to make dinnertime even easier. Bring to room temp for 15-20 minutes before cooking so the middle has a chance to get hot before the coating browns too much. Reheat gently by allowing the leftover crab cakes to come to room temp for 15-20 minutes. Heat a skillet over medium heat with a light coating of oil. Once hot, reduce heat to medium-low and gently warm the crab cakes in the skillet for about 3 minutes on each side. Freeze uncooked crab cakes without the coating for up to 1 month. Defrost in the refrigerator and coat just before cooking. Note, raw onion intensifies in flavor when frozen. 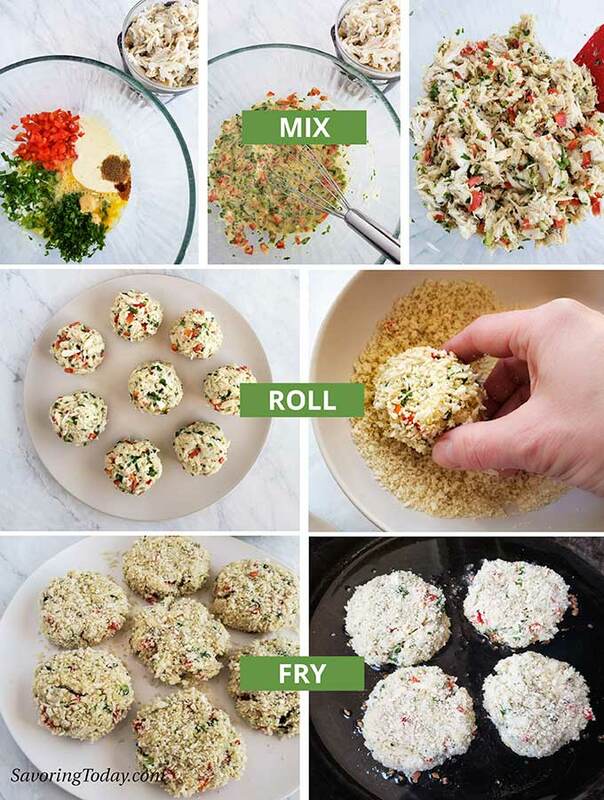 Freeze cooked crab cakes for up to 3 months. Defrost in the fridge and follow the reheat instructions above for best results. A simple, elegant choice for a Valentine dinner as a starter or entree. Panko crumbs create a crisp exterior for sweet crab with savory spices. Pick through crab and remove any shell debris. Mix the first nine ingredients together and gently fold into crab meat. Divide mixture into eight even amounts. Use your hands to gently form mixture into evenly sized balls. Roll in panko bread crumbs to coat and gently press into a flat patty. Mixture will be a little delicate, but should not fall apart. Cover and chill in the refrigerator for 2 hours (this helps them set). Remove from the refrigerator and allow to come to room temperature for 15 to 20 minutes before cooking. Heat 2 to 3 tablespoons olive oil in a skillet over medium heat. Reduce heat to just under medium and cook crab cakes 2-3 minutes on each side until golden brown, adding oil as needed. 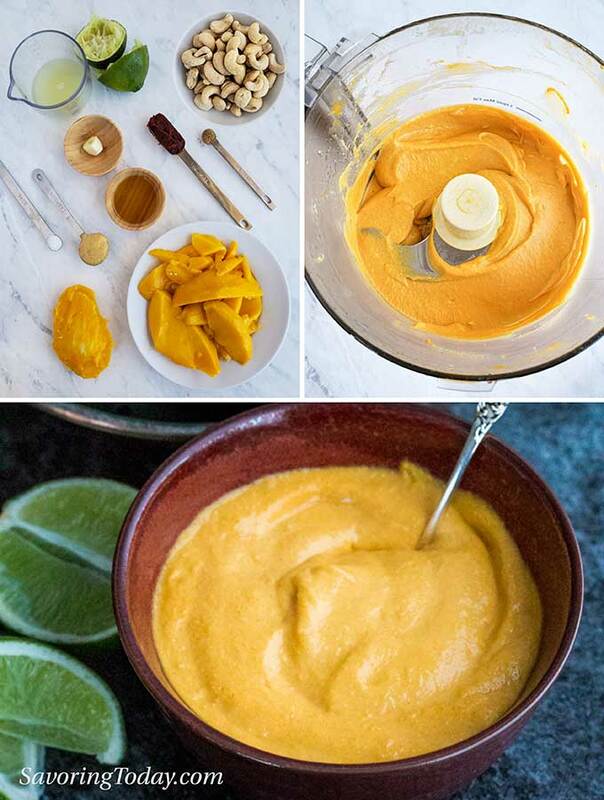 Place all the sauce ingredients in a food processor and blend until pureed and smooth. If the sauce is made in advance and refrigerated, allow to come to room temperature so it isn't cold when served. Spoon the sauce onto a plate and place the crab cakes on top of the sauce or serve on the side at the table. Mangoes vary, seasoning may need to be adjusted depending on ripeness and size of mango. To make this recipe with pecans instead of bread crumbs, heat should be turned to medium-low once the skillet is hot to avoid burning the nuts before the middle is heated through. Cook the pecan coated crab cakes for 2-3 minutes on each side. See salad photo for example. To make the cashew sauce into a salad dressing, thin with 1 tablespoon olive oil and 1 or 2 tablespoons water. Select lump crab because you'll want some larger, meatier pieces in there for the best texture. Blue crab is the tastiest option with a delicate, sweet seafood flavor. I can’t wait to try your version. I make a similar dish but with a mango salsa. Your sauce sounds so very interesting. Love crab cakes! Mrs KR and I were just talking about making a batch a couple of days ago — it’s been ages. Yours look perfect, and I love the way you’ve flavored them. I’ve used a lot of different seasonings, but always come back to Old Bay. Good stuff — thanks. 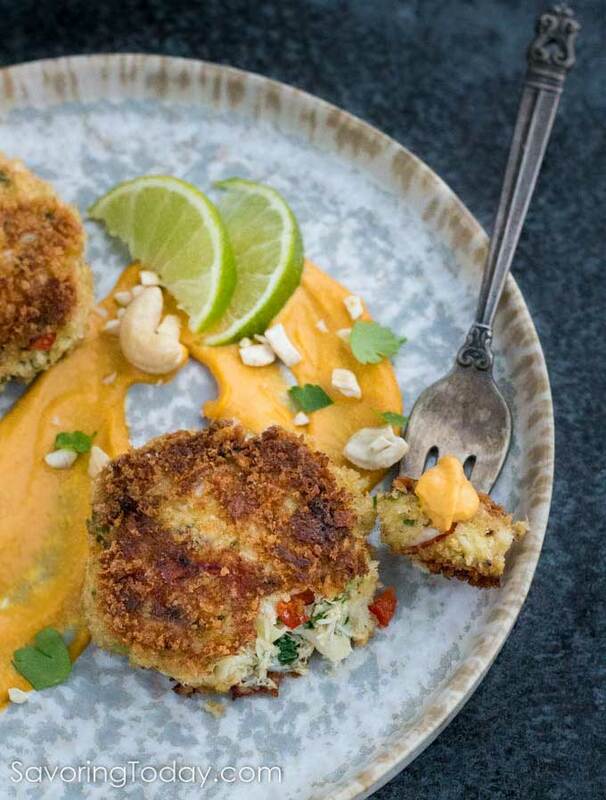 I love a good crab cake and these look like they are delicious! Full of crab meat too! 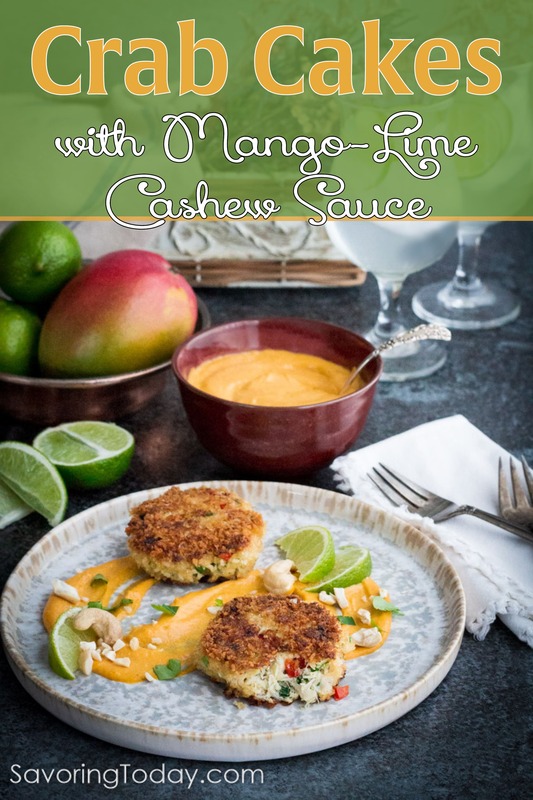 I love crab cakes, but with mango lime cashew sauce they must taste heavenly! What a great recipe. I love the idea of serving these for breakfast! With eggs, they would be so delicious! I love crab but don’t eat it enough! I love this healthy version of crab cakes – and that cashew sauce sounds wonderful! Oh wow, this is absolutely incredible and so perfect for any special day! I love crab cakes and I have not had mango lime cashew sauce before! I really love the sauce and its ingredients! There’s nothing better than good crab cakes! I live that there’s a gluten-free and paleo option, and I’m so intrigued by the cashew cream sauce. Great recipe! Crab cakes are so darn good, aren’t they? I don’t often have them with an egg on top, but it’s a brilliant idea. Winner of a recipe — thanks. I love crab cakes. They are umami-packed and healthy delicious. Also, they are perfect for Valentine’s Day romantic dinner, too! These actually make me think of my daughter! She will love that sauce and is a huge crab cake fan, so thanks! I love crab cakes, but that cashew sauce is what really caught my eye. Sounds amazing together!! Wow, this looks so good and that Paleo version is inspired. I normally don’t have the patience to make crab cakes but this is definitely changing my mind. What a FUN sauce! My girls will have a blast eating this! Such amazing flavors here. Love the mango sauce. Yum! This is perfect for valentine’s dinner! The flavour combination sounds great! I never knew you could make crab cakes ahead of time! Definitely making these for Valentine’s day dinner with the crushed pecan coating. Yum! What a wonderful Cakes! Crab Cakes with Mango Lime Sauce are one of my favourites and something I always order when I am in the Ca I love the homemade buns as well! Great tips and a lovely way of celebrating a special holiday. Crab cakes are one of my hubby’s favorite meals. He would love these. Thanks for sharing and Happy Valentine’s Day! Thanks for your kind words, Jane, I am camera challenged, so that means a lot! Thanks, Geni, I have enjoyed getting to know you through your blog as well. Thanks for stopping by! Oooh, I love these crab cakes and all your ideas for meal planning!! Each one of them would be perfect. I’m going to check out all your links. Thanks for a great round up! Old Bay and lump crab. Looks like a winner. Your previous meals sound wonderful too! I love crab cakes and the mango and lime combination is brilliant! These sound delicious, Judy. For me, that’s because the ratio of lump crab to the other ingredients is a good one. Far too often, you can taste all of the ingredients except for the crab. As much as I would love them for dinner, your idea of serving them with a poached egg for breakfast sounds too good to pass up. The poached egg on top was super delicious, but you really can’t go wrong either way. awwww!!! This would be great for Valentine’s Day! i’m still debating on whether to dine out for the day or make something for the bf. hahaha… But your crab cakes look really great! !